NMR spectroscopy is a powerful technique for determining structural and functional features of biomolecules in physiological solution as well as for observing their intermolecular interactions in real-time. However, complex steps associated with its practice have made the approach daunting for non-specialists. We introduce an NMR platform that makes biomolecular NMR spectroscopy much more accessible by integrating tools, databases, web services, and video tutorials that can be launched by simple installation of NMRFAM software packages or using a cross-platform virtual machine that can be run on any standard laptop or desktop computer. The software package can be downloaded freely from the NMRFAM software download page (http://pine.nmrfam.wisc.edu/download_packages.html), and detailed instructions are available from the Integrative NMR Video Tutorial page (http://pine.nmrfam.wisc.edu/integrative.html). NMR spectroscopy is a powerful technique used in many areas of biomolecular research, including structural biology, enzymology, signal transduction, physiology, and drug discovery. 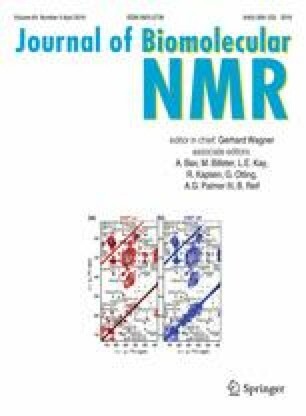 NMR enables the collection of atomic-level data under conditions similar to those in cellular systems. Observable NMR parameters such as chemical shifts, peak intensities, scalar and dipolar couplings, line widths, and cross-relaxation provide critical information about target molecules and their interactions. An advantage of NMR, as one of the primary methods for structure determination, is its ability to detect local changes in conformation and dynamics that play functional biological roles. Despite the growing number of facilities with NMR spectrometers operating at high magnetic fields, the approach has remained largely inaccessible to the larger biological community. In our experience, one reason is the steep learning curve required to become adept at acquiring, processing, and analyzing NMR data. For example, one needs to learn to tailor the experimental approaches and data analysis methods to the aims of the research. In addition, software packages commonly used require different computer operating systems and utilize different standards of atom nomenclature. The fragmentation of protocols presents a high barrier to entry into the field. The Collaborative Computing Project for NMR (CCPN, http://www.ccpn.ac.uk) took steps toward alleviating these problems through its development of CCPNmr Analysis (Vranken et al. 2005). In addition, the WeNMR project offers a number of relevant web-based resources for the process (Wassenaar et al. 2012). Nevertheless, these and other software resources fall short of covering the range of biomolecular experiments in current practice within an integrated package. Our approach has been to develop software tools around the popular Sparky software package developed at the University of California, San Francisco (Goddard and Kneller 2008). We refined this platform through a series of nine annual workshops for neophytes held at the National Magnetic Resonance Facility at Madison (NMRFAM). Our objective was to establish a seamless, interactive environment for use by first-time users as well as practiced NMR spectroscopists. Within this platform, tasks are conducted by a series of freely available software packages, including those developed at NMRFAM. This approach has been refined through feedback from workshop students and worldwide users of these tools. The result of this effort is a software platform called Integrative NMR (Fig. 1), which makes biomolecular NMR spectroscopy much more accessible by integrating software tools so that they interact efficiently in ways that support both manual and automated approaches, result validation, and data visualization. Also included are links to web services, databases, and video tutorials. Although the component software packages are available for separate installation, we provide, as an option, all of them pre-installed in a virtual machine that can be run on any standard laptop or desktop computer. The virtual machine avoids the necessity of installing the separate required software programs within different operating systems. Tasks are conducted by enhanced versions of two main software packages, NMRFAM-SPARKY (Lee et al. 2015) and PONDEROSA (Lee et al. 2011, 2014) in which old and new tools are integrated in efficient ways that emphasize visualization. For example, the Dummy Graph tool in NMRFAM-SPARKY depicts regions of the covalent structure of proteins or DNA/RNA molecules along with the status of current chemical shift assignments of their NMR-active atoms. RNA assignments are facilitated by ellipses drawn over spectra to delineate statistical chemical shift assignment regions for atoms in particular bases (Aeschbacher et al. 2013). Experimental data from spectral series, such as pH titrations, molecular interaction studies, or NMR relaxation, can be visualized seamlessly with the NDPPlot (NMR Data Perturbation Plot) tool in NMRFAM-SPARKY. New visual analysis tools in Ponderosa Analyzer simplify many time-consuming tasks to a few screen clicks. An enhanced mode of the PyMOL software package (The PyMOL Molecular Graphics System, Version 1.7.4 Schrödinger, LLC. ), which supports shortcut commands, enables the visualization of data from the analysis and validation packages of Ponderosa Analyzer. With the virtual machine, a user can launch the calculation of the structure of a protein from NMR data by a few clicks. Without the need to install any individual software packages, the process can make use of APES for peak picking (Shin et al. 2008), PINE for automated assignment (Bahrami et al. 2009), PONDEROSA-C/S for automated structure determination, TALOS-N for shift based torsion angle restraints (Shen and Bax 2013), the PACSY database (Lee et al. 2012), and the CS-Rosetta (Lange et al. 2012) compute server at the Biological Magnetic Resonance data Bank (BMRB). Furthermore, all automated approaches are accompanied by efficient visual verification tools: automated peak picking can be verified by a tool in NMRFAM-SPARKY; errors in automated assignments by PINE can be detected and corrected with PINE-SPARKY (Lee et al. 2009) or ARECA (Dashti et al. 2016); and errors in automated structure calculations can be detected and corrected by the visual tools that are part of Ponderosa Analyzer. A goal of Integrative NMR is to incorporate multiple approaches to the solution of problems as proposed recently (Dashti et al. 2015). For example, peak assignments can be carried out manually or automatically and NOE peaks can be picked manually or automatically. As its default, PONDEROSA utilizes the Xplor-NIH engine for structure determination, but users with a license for CYANA can use the CYANA engine as an option along with its automated NOE assignment module. The default tools are designed to work with well-folded proteins of small or moderate size. NMRFAM-SPARKY contains additional tools that are useful for larger proteins or intrinsically disordered proteins. The developers of SCAssign (Zhang and Yang 2006) for the assignment of larger proteins and ncIDP-assign (Tamiola and Mulder 2011) for intrinsically disordered proteins have permitted their inclusion in NMRFAM-SPARKY. All software, including the virtual machine, is freely available from the NMRFAM website (http://pine.nmrfam.wisc.edu/download_packages.html), and video tutorials available from the website cover every step. The Integrative NMR platform makes use of several software packages developed at the National Magnetic Resonance Facility at Madison (NMRFAM) and elsewhere. The software packages can be installed separately or can be obtained from NMRFAM installed on a virtual machine that can be used on a variety of computer platforms. This latter approach, which does not entail significantly longer software run times, is particularly useful for non-specialists. The platform provides user-friendly interfaces to freely-available servers in the biomolecular NMR field. The originators of Sparky transferred the development of this popular software package to NMRFAM. We modernized and enlarged many parts of the core engine written in C++ with extensions in Python, added new tools that integrate freely-available tools in the biomolecular NMR field, and released the new version as NMRFAM-SPARKY (Lee et al. 2015). For the benefit of legacy users, we kept changes in user interfaces to a minimum. Continued development described here has focused on the addition of new features and their graphical interfaces and on seamless integration with relevant web services. The tools are menu driven, but Integrative NMR supports many shortcut two-letter commands that more conveniently activate individual tools within NMRFAM-SPARKY (Table 1). Easy contour dialog. Enables users to easily adjust contour levels of NMR spectra by a few clicks. A feature lacking in the original Sparky software was data visualization from experiments producing spectral series, such as NMR relaxation or titration studies. In order to add a chart plotting tool that works seamless with NMRFAM-SPARKY, we chose Free Pascal and Lazarus IDE (http://www.lazarus-ide.org) for its development because of their convenience in producing statically compiled executable binaries in Windows, Mac, and Linux and because of our prior experience with this IDE (integrated development environment) in developing the Pine2Sparky converter (Lee et al. 2009). The new graphical plotting program is called NDPPlot (NMR data perturbation plot); although it was developed initially for chemical shift tracing, it has proved to be versatile for use in other applications. The structure calculation server program, Ponderosa Server, and the NOESY peak picking and data transfer program on the client side, Ponderosa Client, are written in C++ with QT libraries (http://www.qt.io). We developed an interface between the PACSY database and Ponderosa Server to support the AUDANA algorithm (Automated Database-Assisted NOESY Assignment) for automated structure calculation (Lee et al., submitted) and the PACSY-ALIGN algorithm for finding similarities within the protein database (http://pacsy.nmrfam.wisc.edu/pacsyalign). We wrote Xplor-NIH scripts (Schwieters et al. 2003) for structure calculation in Python. We wrote NMRFAM-SPARKY Python extension codes for PONDEROSA-C/S interface that make processes flawless. Furthermore, we built web server for public services with HTML, Apache, CGI, Perl, Python, and MySQL on our Linux cluster system. We prepared 256 CPU cores as structure calculation resources at NMRFAM. We added advanced structural analysis tools (written in Free Pascal with Lazarus IDE) to Ponderosa Analyzer, the program that validates results from structural calculations and assists with iterative calculations. In addition, we created interfaces linking Ponderosa Analyzer, NMRFAM-SPARKY, and PyMOL. NMR data for ubiquitin, SIV, and NANOG were acquired at NMRFAM; data for UbcH5B/CNOT4 was from Dr. A.M.J.J. Bonvin’s web page (http://www.nmr.chem.uu.nl/~abonvin/); and data for OR135 was from the CASD-NMR web page (https://www.wenmr.eu/wenmr/casd-nmr). We used data from ubiquitin (unpublished) and SIV frameshift site RNA (Marcheschi et al. 2007) to develop tools, respectively, for general spectral analysis and assignment of proteins and RNA molecules. We used data from NANOG (unpublished) to develop tools for peak height analysis, UbcH5B/CNOT4 (Dominguez et al. 2004) to develop tools for perturbation/titration analysis, and from OR135 (Rosato et al. 2015) to develop of structure calculation tools (Koga et al. 2012). Videos were recorded in OGV format by RecordMyDesktop software (http://recordmydesktop.sourceforge.net), converted to MKV-formatted files, and uploaded onto YouTube (http://www.youtube.com) with added annotations to explain features. Videos can be accessed from (http://pine.nmrfam.wisc.edu/integrative.html); users are encouraged to subscribe to the YouTube channel to receive notifications of uploads of new video tutorials. We provide simple installers for the software components of Integrative NMR on all supported platforms (Python for Linux and Mac, and Windows Batch for Windows). In addition, we make all the software components of Integrative NMR available on a virtual machine. An ISO-formatted 64-bit disk image of Ubuntu MATE 15.04 was downloaded from the Ubuntu MATE web page (http://ubuntu-mate.org) and installed in an ORACLE VM VirtualBox (http://www.virtualbox.org). The software components of Integrative NMR were installed and optimized on this virtual machine. Then, the virtual disk image was exported to Open Virtualization Archive (OVA) format. In addition, we used the 7-zip file compression program (http://www.7-zip.org) to prepare a separated compressed version of the virtual machine for 32-bit operating systems that cannot download files larger than 2 GB from a web browser. The basic approach to peak identification in 2D biomolecular NMR spectra is to search for local maxima above a chosen contour level. If a graphical tool is used to select the peaks, this algorithm is generally successful; however, when peak picking is automated, too many noise peaks can be included. With spectra of dimension greater than two, visual searching, becomes highly time consuming. Therefore, it is common to use a visual peak picking tool to identify peaks in 2D HSQC spectra first and to use automated peak picking restricted to the chosen frequencies to identify peaks in 3D spectra. As with 2D spectra, the automated approach can include noise and artifacts. To get around this problem NMRFAM-SPARKY employs two advanced automated restricted peak picking tools: APES (Shin et al. 2008) and PONDEROSA. With these tools, one can utilize an alternative peak list window (two-letter-code LT) and strip plot window (two-letter-code sp) to complete the peak picking step as illustrated in Fig. 2. The Integrative NMR suite includes the PINE (Bahrami et al. 2009) assignment engine (two-letter-code ep), which supports probabilistic backbone and sidechain assignments based on available NMR data sets. The ranked assignments proposed by PINE are easily validated and extended through the use of PINE-SPARKY (two-letter-codes ip, p2, ab, pp, and pr), which enables the visualization of proposed assignments against experimental spectral data (Lee et al. 2009). Transfer and Simulated Assignments (two-letter-code ta) is a versatile assignment tool recently developed under NMRFAM-SPARKY that uses the PACSY database (Lee et al. 2012) to enable a new assignment method, predict-and-confirm. This approach greatly accelerates assignments by eliminating the redundant procedures and potential user errors associated with the traditional pick-and-assign method. Transfer and Simulated Assignments was originally devised for fast side chain assignment from spectra such as C(CO)NH, H(CCO)NH, and HBHA(CO)NH (Fig. 3a); however, as shown in Fig. 3b, if a corresponding BMRB entry exists, the approach can be used for one-shot assignments based entirely on 2D HSQC spectra. Linear Analysis of Chemical Shifts (LACS) is supported by NMRFAM-SPARKY (two-letter-code lv); LACS detects and corrects errors in chemical shift referencing (Wang et al. 2005). ARECA (Assessment of the REliability of Chemical shift Assignments) is a tool for validating protein chemical shift assignments on the basis of NOE data (Dashti et al. 2016). The input can be prepared by either NMRFAM-SPARKY (two-letter-code ea) or Ponderosa Client from 15N- and/or 13C-filtered NOE experiments (two-letter-code pc). The NMRFAM-SPARKY extension for ARECA (two-letter-code ar) handles data analysis. Chemical shifts can be validated in advance of a structure determination to minimize subsequent refinement steps. Validated assignments are also important for other types of experiments, such as ligand binding or dynamics studies. Pine Graph Assigner, the visual tool for molecular structure visualization in the original PINE-SPARKY (Lee et al. 2009), has been simplified and generalized for universal use as Dummy Graph (Fig. 4, two-letter-code dg). Dummy Graph shows atoms to be assigned along with average and standard deviation of assigned chemical shifts; it also shows the assignment labels for a selected atom and enables the user to visualize the place in a given spectrum where the assigned peak is located. Missing assignments (Fig. 4a) and erroneous assignments (Fig. 4b) can be recognized by direct visualization. NMRFAM-SPARKY supports the assignment of challenging targets such as IDPs and large proteins. For IDP assignment, NMRFAM-SPARKY includes the set of tools developed by Mulder group including their IDP chemical shift statistics (Tamiola and Mulder 2011). The ncIDP-assign package, which consists of ncIDP Repositioner (two-letter-code RS) and ncIDP Spin Graph (two-letter-code SG), is pre-installed. For large proteins, the SCAssign package (two-letter-code sn) supports assignments based on 4D 13C-,15N-edited NOESY and 3D CCH-TOCSY spectra (Zhang and Yang 2006). See http://yangdw.science.nus.edu.sg/SCAssign for an online tutorial from the Yang group. These approaches become more powerful within NMRFAM-SPARKY because they can take advantage of the predict-and-confirm and Dummy Graph methods described above. NMRFAM-SPARKY supports the annotation module of CONNJUR R (Fenwick et al. 2015), which records information about peaks that have been reassigned manually. This functionality can be used to improve the reproducibility of NMR structure determinations. This feature is available on the virtual machine, Linux, and Mac versions of Integrative NMR. RNA-PAIRS is an algorithm for automated RNA imino resonance assignment (Bahrami et al. 2012). NMRFAM-SPARKY contains a link (two-letter-code ER) that generates RNA-PAIRS inputs and redirects the user’s web browser to the RNA-PAIRS web server page at NMRFAM. RNA chemical shift statistics calculated by the Schubert group (Aeschbacher et al. 2013) suggested covariance statistics for 1H and 13C chemical shifts. The RNA Statistical Ellipses window in NMRFAM-SPARKY (Fig. 5a) displays the statistical ellipses overlaid on RNA spectra to assist chemical shift assignment. A nucleic acid version of Dummy Graph (Fig. 5b) displays the atomic structure of the DNA or RNA molecule being assigned. The graphical chart tool, NMR Data Perturbation Plot (NDPPlot), which was originally an internal chart module of Ponderosa Analyzer, has been isolated from the program to be an independent program and also integrated into NMRFAM-SPARKY. NDPPlot supports seamless visualization of a series of NMR spectra, such as time series or titrations. Perturbation Plot (two-letter-code np, Fig. 6a) displays global spectral changes resulting from a change in solution conditions or composition. Titration Plot (two-letter-code ni, Fig. 6b) traces changes in the chemical shift of a particular resonance as the function of a variable such as pH or added ligand. Peak Height Analysis (two-letter-code rh, Fig. 6c) is used in the analysis of data for relaxation measurements. With a few clicks (Save to graphics button), NDPPlot is capable of generating figures and plots in the popular scalable vector graphics format (SVG). The NDPPlot program accepts INI (ititialization) format as input and saves graphics files. It includes useful mouse functions, such as entity identification, zoom in, zoom out and pan. This program is designed for visualizing and analyzing spectral series data; however, we started providing NDPPlot compatible files from our PINE and PECAN web servers because we found that the zooming capability of NDPPlot improved the visualization of data from larger proteins. Because the traditional overlay dialog (two-letter-code ol) is limited to overlaying one spectral view at a time, we added Easy overlay dialog (two-letter-code eo), which lets users select multiple spectral views for overlay onto a specified view (Fig. 7a). A white background, which is better for visualizing differently colored data from multiple spectra, can be selected (two-letter-code ci, Fig. 7b). The Easy contour dialog (two-letter-code ec, Fig. 7c) box enables the adjustment of contour threshold, levels, and colors for multiple spectra. NMRFAM-SPARKY supports both sequence-only (PSIPRED) (Jones et al. 1999) and chemical shift-based methods (PECAN) (Eghbalnia et al. 2005) or (TALOS-N) (Shen and Bax 2013) for secondary structure prediction. Generally, sequence-only methods yield 70–80 % accuracy, and the accuracy can be improved by using chemical-shift-based methods (Fig. 8). For example, we determined that PECAN surpassed PSIPRED in predicting the secondary structure of the small protein brazzein (PDB ID: 2LY5, BMRB ID: 16215) (Cornilescu et al. 2013). Ponderosa Server is a part of the PONDEROSA-C/S package (Lee et al. 2014) that automatically runs TALOS-N and applies optimized torsion angle constraints for the structure calculation. Ponderosa Analyzer, another component of PONDEROSA-C/S, offers tools for refining torsion angle constraints. Integrative NMR supports predictions of protein 3D structure either on the basis of amino acid sequence alone and on the basis of assigned NMR chemical shifts. Jobs to be carried out on external servers are launched from NMRFAM-SPARKY. The sequence-only method, POND-PRED (Ponderosa Prediction Server), which is carried out on an NMRFAM server (http://ponderosa.nmrfam.wisc.edu/model.html), predicts hydrogen bond constraints from PSIPRED results and analyzes the PACSY database to generate distance and angle constraints. This method generates structures by simulated annealing as in typical NMR structure calculations (Fig. 9a). The chemical-shift-based method utilizes CS-Rosetta calculations (Shen et al. 2008) carried out on a server at BMRB (https://csrosetta.bmrb.wisc.edu/csrosetta) that employs the Condor (Thain et al. 2003) grid computing system (Fig. 9b). Integrative NMR supports a complete environment for structure calculation. The initial version of PONDEROSA demonstrated its potential by generating accurate structures from raw NOESY spectra in the second round of the CASD-NMR competition (Rosato et al. 2015). The newer version, PONDEROSA-C/S, that is part of Integrative NMR isolates the computation module on a server allowing the user to focus on the input and output data. The integration of NMRFAM-SPARKY with PONDEROSA-C/S makes it possible to calculate and verify structures with a few clicks. For example, a new structure calculation (two-letter-code c3) requires only clicking to specify the assignment file and raw NOESY spectra and entering the user’s e-mail address (Fig. 10a). Then, after clicking the ‘Submit’ button, NOE cross peaks from the spectra are picked and evaluated, and a pre-packed Ponderosa Server input file is sent to the Ponderosa Web Server for structure determination (Fig. 10b). Details are provided below. The Ponderosa web server is a free computational resource for structure calculation (Fig. 10b, http://ponderosa.nmrfam.wisc.edu/ponderosaweb.html) maintained by NMRFAM. The server benefits from monthly updates of the PACSY DB and offers the most recent version of the Ponderosa Server software (Fig. 10c). As a default, the structure calculation utilizes Xplor-NIH and includes the AUDANA algorithm and water refinement. The final stage of the structure determination calculates 100 structures with constraints obtained from AUDANA by setting the option to Constraints only for final step in the Ponderosa Client program (Lee et al. submitted). The Ponderosa client accepts a wide range of inputs in addition to NOESY spectra. Also supported are: residual dipolar coupling (RDC), small angle X-ray scattering (SAXS), and wide angle X-ray scattering (WAXS) data (Fig. 11a). Manual constraints can be added and combined with automated NOE assignments. Intensity Plot automatically analyzes the intensities from long range peaks and uses an r −6 approximation to predict the 5.5 Å intensity threshold (Fig. 11b); signals beyond this threshold are considered to be noise. The Visual Select tool in Intensity Plot (NMRFAM-SPARKY two-letter-code up; Fig. 11c) supports more refined manual noise threshold adjustment. It visualizes positions at which real peaks are predicted to appear at a certain threshold and allows user to decide whether the data support a real peak. The user is guided to find the optimal noise threshold level by a few clicks. This feature also can be used to determine positions of peaks in overlapped regions of strip plots (Fig. 11d). Structure determination jobs are submitted to the Ponderosa Server. Once the calculations are completed, the user is sent an email containing the URL from which the results can be downloaded. We keep upgrading the program and installing in NMRFAM servers. Thus, a user using our server always uses the latest version at the time without any other installation. Ponderosa Analyzer, which integrates an enhanced version of PyMOL and NMRFAM-SPARKY (Fig. 12), is designed to analyze not only coordinates but also essential characteristics of the protein. Enhanced PyMOL is activated by launching regular PyMOL from Ponderosa Analyzer, which includes several tools described below that can be used to refine the input used for structure determinations. Distance constraint validator (Fig. 12a) is a validation tool for distance information extracted from NOESY data that integrates Enhanced PyMOL (command @p, Fig. 12b) and NMRFAM-SPARKY (two-letter-code up, Fig. 12c). Distance Constraint Validator enables the user to exclude or adjust erroneously extracted inter-proton constraints by simply clicking buttons in the control panel of the program. Ponderosa Violation Investigator (Ponderosa VI) is a simplified validator that runs independently from Ponderosa Analyzer and supports quick violation lookup. With H-bond Manager (Fig. 13), the user can add or remove hydrogen bond information on the basis of experimental H/D exchange data, characteristic NOE patterns, patterns of secondary chemical shifts, trans H-bond couplings, or results from previous calculations. The Blacklist/Whitelist Manager (Fig. 14) provides a graphical user interface that enables the user to modify the weighting factors of inter-residue contacts. For example, if the user determines that two protons are close enough to have an NOE cross peak, the weighting can be promoted. Alternatively, if an NOE connectivity is determined to be erroneous, its weighting can be demoted. Revised constraint files are automatically generated when the user selects ‘Export to the Ponderosa Client’ in the main window of Ponderosa Analyzer. Contact Map illustrates residue–residue contacts from a three-dimensional structural model as a simple two-dimensional plot that reveals secondary structural features (Fig. 15). Contact Map can be used to identify inter proton distances that are shorter than 5.5 Å and are predicted to give rise to NOE cross peaks. Plotting backbone φ/ψ dihedral angles onto a Ramachandran plot provides a useful way of assessing structural quality. A ‘good’ structure is expected to have backbone dihedral angles clustered in the statistically favorable areas, and outliers may be indicative of errors or the presence of forces that perturb the structure to a higher energy state. In addition, large deviations provide evidence for structural flexibility, such as that for S24 in the example shown in Fig. 16a. Pacsy Rama is a tool that enables the user to display the φ/ψ values for residues in a set of structural models against a consensus Ramachandran plot or a Ramachandran plot for the specific residue type (Fig. 16b). Specialized Ramachandran plots were derived from the PACSY database by counting the occurrences of dihedral angles within 4° × 4° φ/ψ voxels restricted by secondary structure type or amino acid type. From these, image files were created for each of the 20 standard amino acid residues and also for the consensus. The images, which are in PNG (Portable Network Graphics) format, are downloadable from (http://pine.nmrfam.wisc.edu/download_packages.html). NOE Bar Chart is a tool that shows the number of distance constraints for each residue used in the structure calculation (Fig. 17). These numbers provide an indication of the quality of the structure and identify regions that are ill-defined. The results may indicate that more effort needs to be expended in identifying additional distance constraints. The Cα RMSD Chart and Random Coil Index Prediction Chart (Fig. 18a) can be used to identify disordered regions. In addition, the Color by Flexibility command (@cf) for Enhanced PyMol can be used to distinguish well-defined from ill-defined regions of the protein (Fig. 19; Table 2). Additional information about internal mobility may be available from cross-relaxation and relaxation results. If heteronuclear NOE data are available, they can be visualized in NMRFAM-SPARKY by means of Perturbation Plot (two-letter-code np, Fig. 7a), and if T 1/T 2 relaxation data have been collected, they can be visualized using Peak Height Analysis (two-letter-code rh, Fig. 6c). The Residue Analysis tool is a visual chart tool for easy recognition of structural properties on a residue basis. Residue Analysis supports structure-based analysis (Fig. 18a) and chemical-shift-based prediction (Fig. 18c). For the best 20 models from the structure calculation, the structure-based analysis provides a visualization of Cα atom RMSDs to the average structure, secondary structure, dihedral angles (φ and ψ), hydrophobicities, and solvent accessible surface area (SAS). Chemical-shift-based prediction provides a visualization of secondary structure and random coil index derived order parameters (S 2) predicted from TALOS-N (Fig. 18b). Comparison of the results can yield insights about the quality of the structure determination and the particular characteristics of the protein. RDC data provide global information about the orientations of individual bonds or entire secondary structure elements and can be used to validate or refine structures determined from NOESY data. This is particularly useful for all α-helical proteins or large proteins. RDC data can be included in the input to the Ponderosa Server and used to enhance automated NOE assignments. The RDC Analysis tool from Ponderosa Analyzer can be used to create a plot of experimental RDC data versus RDCs calculated from the structure (Fig. 20a). The linear least squares fitted line (gray dashed line) indicates the agreement between the experimental RDCs and the RDCs calculated from the structure generated by Ponderosa Server. Enhanced PyMOL (command @cr, Fig. 19) can be used to visualize the correlation between experimental and calculated RDCs and to depict potential errors in the 3D structure. In the illustration shown, residue E40 (colored in red) in the calculated structure does not agree with the input RDC data; thus, E40 is flagged both by the RDC Analysis tool in Ponderosa Analyzer (Fig. 20a) and by Enhanced PyMOL (Fig. 20b). As part of Integrative NMR, Enhanced PyMOL offers a range of data visualization options activated two- or three-letter shortcuts typed into the PyMOL command-line (Table 2; Fig. 19). Chemical shift assignments and peak lists generated by Integrative NMR can be outputted in NMR-STAR format (Markley et al. 2003) for direct deposition to the BMRB or wwPDB. Structural analysis method described above for biomolecules are produced as video clips for any non-NMR expert to easily use NMR data in their research. They are freely available from the NMRFAM-SPARKY web page: (http://www.nmrfam.wisc.edu/nmrfam-sparky-distribution.htm), from the PONDEROSA-C/S web page: (http://ponderosa.nmrfam.wisc.edu/videos.html), or from the combined video playlist page: (http://pine.nmrfam.wisc.edu/integrative.html). All NMRFAM software is freely available from the NMRFAM Software Download page (http://pine.nmrfam.wisc.edu/download_packages.html). The Integrative NMR method requires the installation of NMRFAM-SPARKY, Ponderosa Analyzer, Ponderosa Client and PyMOL. The website provides instructions, installation scripts and video tutorials for their installation. The NMRFAM Virtual Machine is recommended for non-specialists, because it contains pre-installed versions of scientific software packages developed by NMRFAM and elsewhere, including NMRFAM-SPARKY, Ponderosa Client, Ponderosa Analyzer, Ponderosa VI, and PyMOL along with its Adaptive Poisson-Boltzmann Solver (APBS) plugin (Baker et al. 2001). A set of examples based on target OR135 from the second round of CASD-NMR is also included. The virtual machine (VM) can be run under a number of different virtualization software programs (VirtualBox and VMware among others) that support the Open Virtualization Format (.ovf, .ova). These virtualization programs are available for a wide variety of different popular host computers and operating systems (Windows, Mac OSX, Linux). A VM emulates a complete computer system. For example, the base operating system of the Integrative NMR VM is Ubuntu Mate 15.04 (64 bit Linux) (https://ubuntu-mate.org); the virtualization software allows this Linux VM to run natively on any host computer. This work was supported by a Grant (P41GM103399) from the Biomedical Technology Research Resources (BTRR) Program of the National Institute of General Medical Sciences (NIGMS), National Institutes of Health (NIH). We are grateful to Dr. Daiwen Yang from National University of Singapore, Dr. Alexandre Bonvin from Utrecht University, and Dr. Frans Mulder from Aarhus University for permitting their contributions to be included in NMRFAM-SPARKY. We also thank the WeNMR Project (European FP7 e-Infrastructure Grant, Contract No. 261572, www.wenmr.eu), supported by the European Grid Initiative (EGI) through the national GRID Initiatives of Belgium, France, Italy, Germany, the Netherlands, Poland, Portugal, Spain, UK, South Africa, Malaysia, Taiwan, the Latin America GRID infrastructure via the Gisela Project, the International Desktop Grid Federation (IDGF) with its volunteers and the US Open Science Grid (OSG) for the sufficient example sets for the development of tools.